When I think of Christmas, I think of snowflakes. I'm not totally sure why, because I live in Louisiana where it rarely gets cold, much less snows. I'm totally fine with warmer weather. I am not a girl who likes cold weather at all. We lived in Germany for a few years and it snowed all winter. When it snowed I stayed in my pajamas all day and didn't leave the house. I'm surprised I even survived. I need warm weather and cute shoes. When you go out in the snow the bottom of your jeans get wet, it's just gross to me. Don't get me wrong it's beautiful to look at but, that's about it. 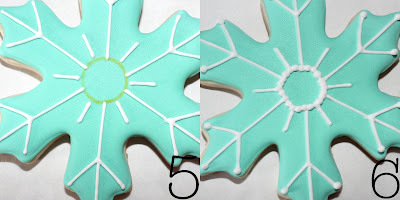 So I'll just make pretty snowflake cookies and enjoy the warmer climate. 2. 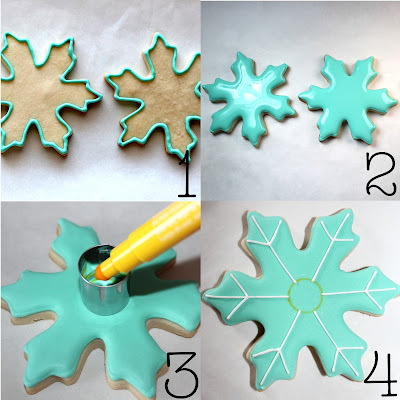 Fill cookie with flood consistency icing. Let dry overnight. 3. With a food safe marker take a small circle cutter and outline a circle in the center of the cookie. 4. Next, using white outline consistency icing and a #1 tip, start piping lines from edge of circle to the tip of snowflake. 6. Then add dots around center circle and on tips of lines. Allow to dry for several hours. Thanks Cristin. How's that grandbaby doing? I live in New Orleans and it's rarely cold here. I love the warmer climate. When it's 60 outside I freeze lol.